This is my third top box, and once again, I am quite pleased! Received an email asking if I would like the original top box packaging or the eco friendly one, I opted for the latter. I was pleasantly surprised when I opened the first product which was wrapped in the purple tissue–a Deborah Lippman nail polish! One alone is worth about $20, so receiving one of these is already worth the whole box. 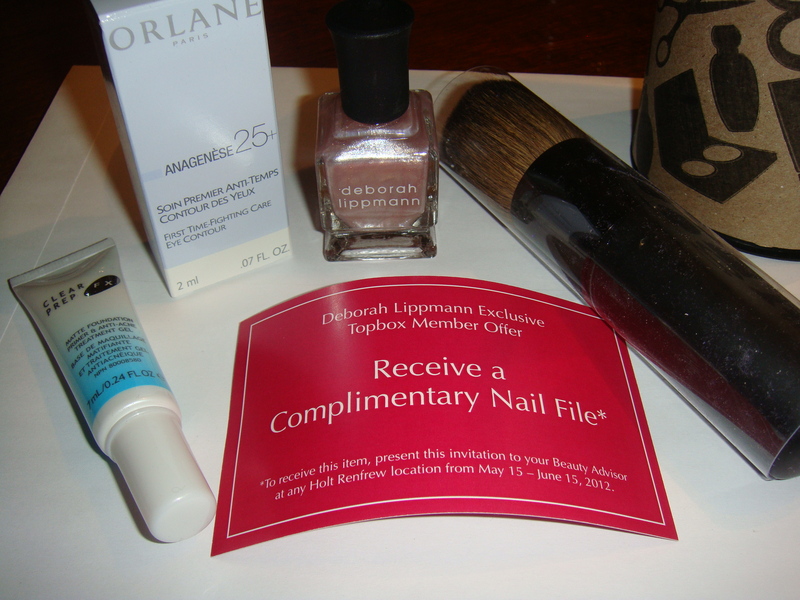 – Glad to have received a Deborah Lippmann polish in this month’s box. The colour is a nice pink, metallic with tiny specs of glitter in it. Can’t wait to try it! – An anti-shine primer to reduce lines and pores and also helps prevent and heal acne blemishes. I am still working on finishing up a different face primer so this has to wait! – This is an eye cream to diminish fine lines, puffiness and dark circles. I’m still working on another eye cream, so I will try this one later once I’m done. – Can’t believe I received a makeup brush in this month’s box! This one is a bronzing powder brush and it feels quite soft to the touch. I was planning to purchase a new bronzing brush, so this is perfect. I have not previously heard of this brand, so I’m looking forward to trying this one out. Overall, these products will all be used and tested out when I get the chance. The only thing that I didn’t like is that I received the same colour family of nail polish and a face primer in the past 2 boxes, but they ARE different brands, so I’ll see which one I like better. Topbox also included a “Complimentary Nail File” coupon from Holt Renfrew as a Topbox member offer. Neat! What did you receive in your May Topbox? June 2012 Topbox « take her word. I don’t have Topbox yet but I am so excited for whenever I do get on it. i LOVEEEEEEE Deborah Lippmann nail polish and I’m excited that a monthly box included that in it. It looks great.